Novartis, the maker of Gilenya (fingolimod), said it has been informed of a third case of progressive multifocal leukoencephalopathy (PLM) in a patient with relapsing multiple sclerosis (MS) taking Gilenya who did not have prior exposure to natalizumab treatment. This latest report follows a warning doled out by the FDA earlier this month regarding two cases of PML in users of Gilenya, one confirmed, and one suspected. Both cases referenced in the FDA warning had no prior exposure to other immunosuppressant drugs for MS or other conditions. Novartis, who has informed the FDA of the latest incident, said the diagnosis of PML in this case was based on suggestive clinical symptoms, MRI findings, and blood tests for John Cunningham virus. While the patient did not have prior exposure to natalizumab, they did have a history or colorectal cancer that was treated with chemotherapy and radiation, as well as Crohn’s disease. “Novartis is in active discussions with external advisors to review details of this case and the role of various risk factors contributing to the development of PML,” the company said in a statement on its Gilenya Information Center website. 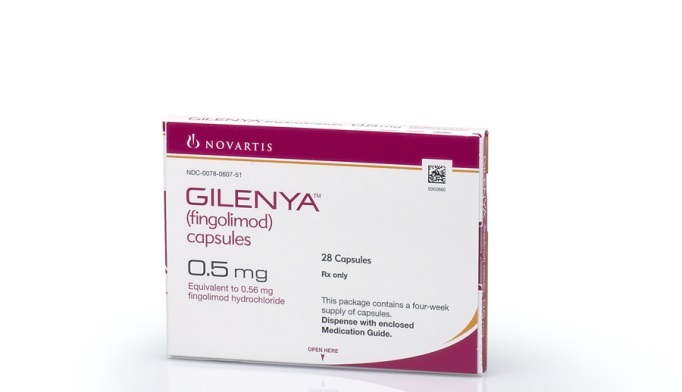 Novartis recently updated prescribing information for Gilenya to create more awareness of PML, its risk factors, and symptoms. However, the company said it continues to stand behind the positive risk-benefit profile of Gilenya. There are approximately 125,000 people with relapsing MS being treated with Gilenya. This is possibly the fourth case of PML linked to Gilenya. In August 2013, the FDA reported that a case of PML in a patient using Gilenya could not be conclusively linked to the drug because the patient had previously been treated with immunosuppressant drugs prior to treatment with Gilenya, and had also received intravenous corticosteroids during treatment with Gilenya. Any adverse effects or side effects from this product should be reported to the FDA’s MedWatch Safety Information and Adverse Event Reporting Program.